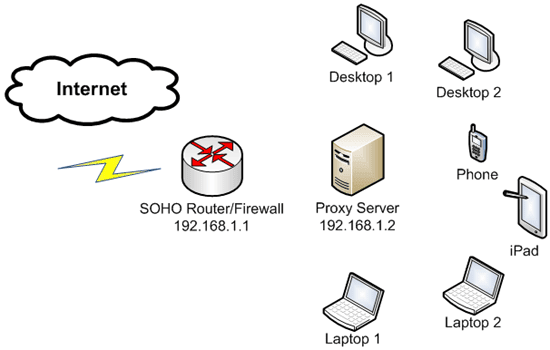 This tutorial describes how to protect your home / office network users from objectionable internet contents with help of HTTP proxy. Our goal is to set up a free Linux based server running Squid and deploy web filtering application on it saving bandwidth, speeding up web access and blocking obsessive and potentially illegal and malicious web files. In this tutorial I will assume that network environment consists of a SOHO level router that distributes wireless Wi-Fi, several desktop and laptop computers, iPads and some mobile smart phones as shown on the above network diagram. Our proxy server will be built using free version of CentOS Linux 6.2. It is also possible to use RedHat Linux 6.2 with paid subscription of you need guaranteed level of support for your servers. In order to install CentOS Linux, go to http://mirror.centos.org/centos/6/isos/i386/ and download the CentOS-6.2-i386-minimal.iso image file. Burn it on a spare CD, insert into your server's CD drive and power it on. Follow the installation steps accepting the defaults or customizing the required parts of the install according to your needs. Configure machine hostname as "proxy" and root password as "root123" (without quotation marks). Wait until the installation is complete and then reboot the system. The installed version of CentOS usually does not have network connectivity enabled by default. In order to enable network access we need to perform the following. in the root terminal. Squid and all related packages and dependencies are downloaded from the Internet and installed automatically. Also check that http_access allow localnet and acl localnet src 192.168.0.0/16 are present in the configuration file. Verify that Squid runs correctly by pointing your user browser to the IP address of the Proxy Server (192.168.1.2) and surfing to some of your favorite websites. NOTE: you may need to adjust firewall settings in CentOS in order to let proxy users connect to port 3128 on the Proxy Server. Use system-config-firewall-tui or iptables commands to do that. A good idea would be to allow access also to port 80 as we will use this port for managing QuintoLabs Content Security through Web UI. Next step is to install Content Security for Squid from QuintoLabs (I will refer to it as qlproxy further in text). For those who do not know, QuintoLabs Content Security is an ICAP daemon/URL rewriter that integrates with existing Squid proxy server and provides rich content filtering functionality to sanitize web traffic passing into internal home / enterprise network. It may be used to block illegal or potentially malicious file downloads, remove annoying advertisements, prevent access to various categories of the web sites and block resources with explicit content (i.e. prohibit explicit and adult content). We will use version 2.0 of qlproxy that was released this month. The most prominent feature of that release is a policy based web filtering when users of the proxy are organized into several groups with different levels of strictness. By default qlproxy comes with three polices preinstalled. Strict policy contains web filter settings put on maximum level and is supposed to protect minors and K12 students from inappropriate contents on the Internet. Relaxed policy blocks only excessive advertisements and was supposed to be used by network administrators, teachers and all those who do not need filtered access to web but would like to evade most ads. The last group is default and contains less restrictive web filtering settings suitable for normal web browsing without explicitly adult contents shown. The yum installation manager will run for a while and the program will be installed into /opt/quintolabs/qlproxy (binaries), /var/opt/quintolabs/qlproxy (various logs and content filtering databases) and /etc/opt/quintolabs/qlproxy (configuration). QuintoLabs Content Security may be integrated with Squid in two different ways - as ICAP server and as URL rewriter. It is recommended to use ICAP integration as it gives access to all HTTP traffic passing through Squid and allows qlproxy to perform full request and response filtering (ICAP is supported in Squid version 3 and up). and try surfing your favorite web sites and to see how many ads are blocked. Another useful test is to go to the eicar.com web site and try to download a sample artificial eicar.com virus to see that *.com files are blocked by the download filter. Put all normal users into Strict filtering policy by adding their IP addresses (or user names if your Squid performs authentication) to the strict/members.conf file. Put all power users into Relaxed filtering policy by adding their IP addresses or user names to the relaxed/members.conf file. Enable extended AdBlock subscriptions for blocking English, German and Russian ads in blocks_ads.conf configuration file for both policies. Also block common web tracking engines by uncommenting EasyPrivacy subscription in the same files. Increase the level of adult blocking heuristics to "high" in the strict/block_adult_sites.conf file. Although it may result in excessive false blocking there is always the possibility to add incorrectly blocked site to exception list. The UrlBlock module that uses community developed database of categorized domains incorrectly puts blogspot.com into an adult category... so we will add it to the exception list of a relaxed policy in relaxed/exceptions.conf to be able to read the blogs. Knowing that worms, trojans and other malware related software often connect to the world by numeric IP addresses instead of normal hostnames, we will put a magic regexp url = http://\d+\.\d+\.\d+\.\d+/. * into strict/block_sites_by_name.conf file to block access to web sites by IP. QuintoLabs Content Security contains a minimal Web UI that lets you see the current program configuration, view reports of usage activity and program logs from a remote host using your favorite browser. Web UI is written using Django Python Framework and integrates with Apache using mod_wsgi deployed in virtualized Python environment (to minimize package dependences). NOTE: if you get "Access denied" error page trying to access http://localhost then check if SELinux permissions might be preventing access to /var/opt/quintolabs/qlproxy/www/qlproxy/ directory for httpd process. After restart of Apache navigate to http://192.168.1.2/qlproxy to see program configuration, logs and generated reports. The only thing left is to point network users to Proxy Server. There are several possibilities to do that automatically (think WPAD) but for testing purposes manual proxy configuration should be more than enough. So point the browser to proxy at 192.168.1.4 port 3128, surf to some favorite web sites and see the difference - IP addresses in URLs are blocked, explicitly adult content sites are forbidden. RAM and CPU usage on the server is minimal, surfing experience is acceptable. System is automatically updated once a day for the latest URL block list and AdBlock subscriptions and requires minimal additional maintenance.